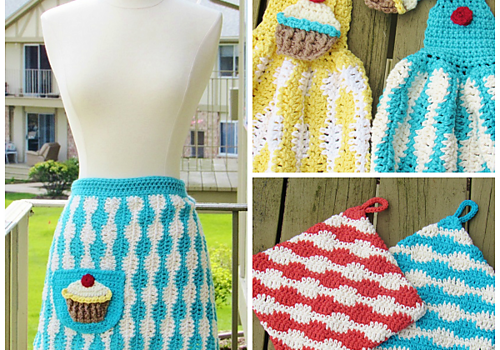 Make your own awesome cupcake apron and get ready for your next cookout! 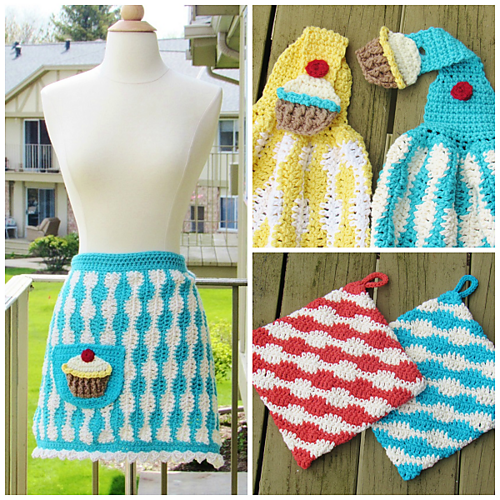 This stylish Baker’s Apron by CrochetDreamz makes a great gift idea. 1. Worsted weight cotton yarn. Lily Sugar ‘n’ Cream in colors Soft Ecru and Hot Blue were used for the sample. The apron took 4 balls, two in each color. 2. Hook I (5.5 mm) for the apron and H (5mm) for the cupcake and pockets. 3. Yarn needle to weave in the ends. 16 inches tall and 25 inches wide, fits a woman Small or Medium. Tip to increase the width for bigger sizes is provided.